The new adaptation of Jin Yong’s (金庸) Return of the Condor Heroes <神雕侠侣> is currently in production, and it’s finally confirmed that Little Dragon Girl would be played by rookie actress Mao Xiaohui (毛晓慧). The 22-year-old will be starring alongside Meteor Garden <流星花园> reboot star Dylan Wang (王鹤棣), who will play Yang Guo. Michael Miu (苗僑偉), Lei Jiayin (雷佳音), and Shao Bing (邵兵) are among the stars who is also confirmed to star in the remake. Michael will play Huang Yaoshi, Lei Jiayin will star as Wang Chongyang, and Shao Bing will play the older Guo Jing. The filming of ROTCH is under tight wraps, and not much about its production is being shared with the public. Nonetheless, this hasn’t stopped netizens from dreaming about what-if’s… if Mao Xiaohui didn’t end up being the star, who would be the worthy candidate to portray Little Dragon Girl? 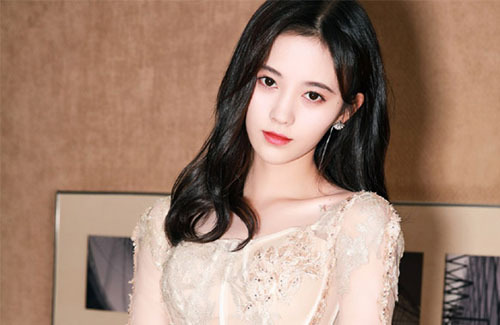 Some netizens managed to dig up 4-year-old photos of graduated SNH48 member Ju Jingyi (鞠婧祎) cosplaying as Little Dragon Girl, and it was a surprise find. If Mao Xiaohui wasn’t chosen to be the one to introduce a new generation of audiences to Jin Yong’s wuxia world, then Jingyi would surely be the golden option. At 24 years old, Jingyi has quite a few achievements under her belt. 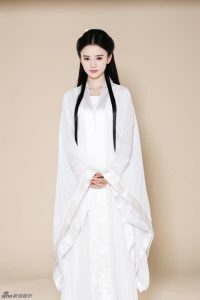 Aside from a successful idol career with her 48 sisters, she has also starred in a few successful television dramas, such as Novoland: The Castle in the Sky <九州·天空城>, Xuan-Yuan Sword: Han Cloud <轩辕剑之汉之云>, Legend of Yunxi <芸汐传>, and Mr. Swimming <游泳先生>, in which she starred alongside Thai pop star Mike. She will soon be seen in television again with the upcoming period drama Please Give Me A Pair of Wings <请赐我一双翅膀>, starring opposite Aaron Yan (炎亞綸), Han Dong (韩栋), and Zhang Yuxi (张予曦). These two are an improvement from the last XLN we know (Michelle Chen) but that does not mean they are suitable. And aren’t we getting too many and too frequent adaptations of Louis Cha’s novels? Where are all the good scriptwriters? These days are just remakes and adaptations. Pretty but not Dragon Girl. I know most hates Crystal Liu but for me she looks the part. @funnlim Crystal Liu definitely looked the part more than Michelle Chen did…although I guess that’s really not saying much since Michelle Chen was horribly miscast. But I just found Crystal Liu’s acting back then to be really subpar, so hopefully this new Little Dragon Girl will be better. I thought Ju Jingyi was cute in “The Legend of Yunxi”…partly because of her chemistry with Zhang Zhehan. But honestly, she has that kind of withdrawn face of someone who is too thin and mostly skin and bones. Michelle Chen has a cute round face, but that doesn’t really fit Little Dragon Girl. Alas, I agree that Crystal Liu really looked the role. Among the young actresses (early to mid 20s)…I know that there are a lot of cute and pretty faces, but I can’t name one that has the gravitas for Little Dragon Girl off the top of my head. Ps..ps..Zheng Shuang right? Yes it does to me. It was the voice that dubbed her in Yunxi that made her pretty and bearable. This may be sacrilegious, but I never liked the character of Little Dragon Girl. I loved the old Return of the Condor Heroes with Andy Lau but Little Dragon Girl was so beautiful and perfect and boring. The story is just awesome and progressive for its time, but perhaps it’s the screen translations, she is just dull.